Eight years ago, your lives were changed forever as Hurricane Katrina came ashore. I remember hearing the news and watching the miles and miles of devastation along the Mississippi Gulf. Our church rallied together, collecting two truckloads of water, toiletries and clothing. Within a week, my husband Barry and his best friend Mike set off for southern Louisiana. They were stopped short due to road closures and left all our supplies at a church acting as a safehaven for evacuees. Upon their return and testimony, we realized that wasn’t enough. A mission trip team was formed with our eyes set on New Orleans. They of course had the most need…so we thought. We began raising money and were scheduled to work the first week of June 2006. In late January, we received our assignment – it was HazMat! We would have to wear protective suits as we would be mucking out houses that had been underwater and left untouched. Due to the health risks involved, we had to reject this plan. Now what do we do? We had raised lots of money for Katrina Relief. Our mission trip leader, Mike Hinman, prayerfully set out to find another community that needed our help. While surfing the web, he came across a little website called rebuildlakeshore.com. After contacting Pastor Don, we switched our arrangements from New Orleans to Lakeshore, Mississippi. In June, we traveled 20 hours from Maryland to Mississippi by bus. We couldn’t wait to arrive and be of service. We were excited to be on such an important mission to change lives. We had no idea that God ever present in this sleepy little town of Lakeshore was about to change our lives. Our bus was cheerful as we made our way through Tennessee, Georgia and Alabama. We saw other teams at rest stops and were overjoyed to be part of a national relief effort. The closer we came to the Gulf coast, reality started to sink in. We saw FEMA trailers lined up in large lots and forests of trees snapped in half like toothpicks. That is when our bus became quiet. We then saw abandoned cars and trailers on Highway 90. We turned down Lakeshore Road and saw your school in rubble, houses boarded up, clothing hanging in trees, a FEMA trailer park. The compound at Lakeshore Baptist Church looked like a MASH unit in a war zone. I remember thinking “What had I done? bringing my husband who was undergoing chemotherapy at the time down here to work in these dire conditions? ?” We quickly realized we were standing at ground zero of this horrific storm. We didn’t know what to expect…we didn’t know what we would be able to accomplish in only one week’s time…we didn’t know where to even begin. The next morning we met Greg and James and were told our word for the week was FLEXIBILITY. We soon found out why. Our group was split into 3 work sites. There were no street signs or traffic lights so directions were difficult to follow. Building supplies were limited, if they could be found at all. There were no trees for shade. There was no electricity for air conditioning or fans unless you had a generator. And it was hot as the dickens. On this anniversary, I want you to know that you have not been forgotten. We pray for you constantly. We are so proud to have had the opportunity to work side-by-side as you stood strong as a Church. You have showered your community with Blessings upon Blessings. Your distribution center remained open when others closed. You have fed and clothed thousands and thousands of people. You have offered school supplies and uniforms and vacation Bible school to the children. You have collected toys and gifts from across the nation to hand out at Christmas. You have taught people how to grow a garden and how to manage a budget. You have given money and supplies to those in need and have helped demolish, rehab and rebuild hundreds of houses. You have ministered to your community and brought many to the Lord. You have certainly shown His Glory through all of these endeavors, and many many more. Happy Anniversary Lakeshore Baptist Church. When I dove into the blogosphere in January of last year, I had little anticipation of making much of a splash. Little did I know that in God’s providence my blog would serve as a tool to bring thousands to Lakeshore in the wake of the worst natural disaster to ever hit the continental United States. For the past 15 months, I have used my blog to chronicle the relief, recovery, and rebuilding efforts in Lakeshore. The overwhelming task has kept me from doing little more than offering brief snapshots into the ongoing miraculous outpouring of God’s mercy. Shortly after the storm, our friends created a web site to aid in communication of ongoing needs. Hundreds of teams continue to flood Lakeshore with their generosity, yet so much remains left to do. God has given us a passion to see the work through to completion – a task that will take years. Knowing that information fuels interest and efficiency we have re-launched our Rebuild Lakeshore web site. We pray that the the newly designed site will benefit groups wanting to help with ongoing needs and projects, teams making mission trip plans, and individuals wanting to keep up to date with the progress in Lakeshore. Check the Rebuild Lakeshore blog often or subscribe to the rss feed. Keep us in your prayers as we strive to Rebuild Lakeshore to the glory of God and see the fame of His name spread through our community. Lord willing, I plan to continue posting to both sites. My Locust and Wild Honey blog will probably revert to some of its pre-storm flavor with devotional thoughts, personal opinions, information of interest, book and web site recommendations, historical tidbits, and miscellaneous musings. The Rebuild Lakeshore blog will serve as a news outlet for the ongoing relief, recovery, and rebuilding efforts. I wish I had time to blog about every team and every project. God continues to flood us with His overwhelming mercy and grace through the sweat and tireless efforts of so many folks. Over 30 different groups worked with us in October alone. I thank God for the great people last month who came from Immanuel Baptist Church – Louisville, Ky, Mt. Harmony – Riceville, TN, First Baptist Church – Tullahoma, TN, Midway Baptist Church – Meridian, MS, Highlands Fellowship – Abingdon, VA, Sixth Street Baptist – Alexander City, AL, Oleander United Methodist – Arab, AL, Tammy’s team from KY, Trinity Baptist Church – Baton Rouge LA, Kyle Jefferies and his group, AL, Hillsboro Baptist Church – Hillsboro, MS, Grace Bible – Southern NJ, Hagood Baptist – Barnwell, SC, Lineville Baptist Church – Lineville, AL, Heritage Hills Baptist Church – Douglasville, GA, Oakhurst Baptist Church – Clarksdale, MS, Providence Presbyterian Church – Hilton Head, SC, University of Mississippi – Oxford, MS, Sierra First Baptist Church – Alta, CA, Harvest Community Church – Charlotte, NC, Schriever Baptist Church – Schriever, LA, Northgate Baptist Church- Beckley, WV, New Beginning Family Worship Center – Northport, AL, Grace Bible Church – Canton, GA, New Life Church of Baton Rouge LA, Lima Baptist Temple – Lima, OH, Heritage Fellowship – TN, First Baptist of Natchitoches – Natchitoches, LA, First Baptist Church – Altamont, KS, Jeff Gardner, MI, First Baptist Benton – Benton, AR, Reunion Church – Chicago, IL, and I probably overlooked a few. With most of these groups working on multiple projects, you can see why I have a hard time keeping up. Someone might feel the temptation to think that with all these folks that we have all the help we need. Nothing could be further from the truth. Come play your part in an overwhelming ministry of hope. Call us at (228) 469-0110 to plan your mission trip to Lakeshore. Over the past 14 months, I have been asked the same question hundreds of times. When people discover that the eye of hurricane Katrina passed right over Lakeshore, they ask, “Did the storm destroy your church?” Our answer remains, “No. The storm did not destroy the church. It did demolish the buildings, but the church still stands strong.” While the winds and water wiped our structures completely off of the property and left our entire congregation homeless, the storm could not rip apart the community of faith God established in Lakeshore. On Reformation Day, as I think of churches being demolished or standing strong, I’m reminded of Martin Luther’s bold assertion: the church stands or falls on the doctrine of sola feda (Faith Alone). I preached Romans 1:17 this past Sunday. btw, in celebration of Reformation Day, check out the audio from today’s “Renewing Your Mind” broadcast. “Martin Luther’s Here I Stand” hosted by Max McLean. I think it was last November when Northside Baptist Church of Charlotte, NC sent a team down to Lakeshore. This wonderful energetic crew helped in so many ways. In the video you can see them pouring the footers for our metal quanzet hut that serves as our temporary church building. The pictures encouraged me this morning because many of the homes they were doing preliminary work now have families living in them. For example, you see them hanging sheet rock in the Ward’s house – the Wards now have a beautiful home. They worked in the Nesome’s – the Nesomes now live back in their spacious house (FEMA campers get mighty cramped with 6 kids). We could not have made a dent in the progress over the last 14 months without teams like Northside Baptist and hundreds of others giving of their time and talents to come down to lend assistance. Plenty of work remains to be done. Thousands of people still live in campers and need your help to rebuild their homes. Videos like this give you a glimpse into what a mission trip to Lakeshore feels like. Why not plan your trip today? Call our church office at (228) 469-0110 for details. If no one answers, it means we are probably all out working on houses. Please leave a message and we will return your call asap. We would love to see you come help rebuild Lakeshore to the glory of God. My friend, Cindy Swanson, interviewed me for her radio show a couple of months ago. 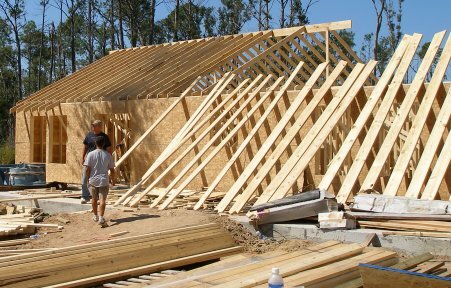 You can read and hear excerpts here: Katrina: One year later, a Mississippi church continues to rebuild. I want to thank Cindy and others who continue to help keep the relief, recovery, and rebuilding efforts in the conscience of people from across the country. We’ve seen progress over the past 14 months, but the task continues and we face years of ministry opportunity. btw, Cindy also interviewed Justin Taylor recently as they discussed the question, “Where is God when bad things happen?” They highlighted the book “Suffering and the Sovereignty of God” that grew out of the 2005 Desiring God National Conference. 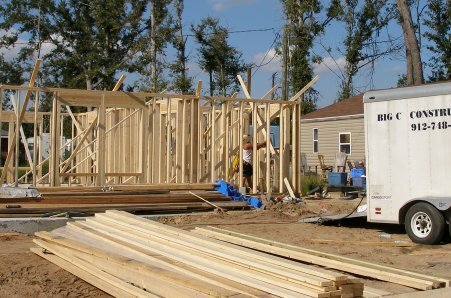 In God’s providence, the conference came weeks after Katrina devastated our community. A year later we used the DVD series to re-enforce many of the issues we have grappled with since the storm as we point to our all-valuable sovereign God who can hold a hurricane in his hand as He turns unthinkable tragedy for His glory. Let me recommend the material in book form, DVD, or free downloadable mp3. One year ago our friend Stephen Ake made his first trip to Lakeshore, just 7 weeks after the storm. Since then, he has averaged about one trip a month. Read about his thoughts on Lakeshore – 1 Year Ago and Now. Every trip he has tried to post images that capture the progress of the clean up and rebuilding efforts. Check out his Lakeshore Gallery. I’ve also placed a link in the sidebar for continuing reference for those looking for more pictures. Everyone who has been to Lakeshore over the past 14 months has fallen in love with James and Mrs. Bea. Mrs. Bea serves tirelessly in our food distribution center. James works as our right hand man in the rebuilding efforts. Katrina completely destroyed their home. The week after the storm I posted a plea to find them a camper to live in. They later moved into a FEMA issued camper and then into a garage built by volunteers. Its great to see their house finally going up. Our friends from Trinity Lutheran Church, Joppa Maryland created this great video of their trip to Lakeshore.